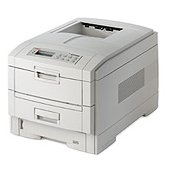 With the C7550n Series color printer, OKI delivers business color printing without compromise. Full-color output at up to 24 pages per minute and monochrome at up to 26 ppm. Advanced color-matching technology and high-speed data processing are integral to the C7550 Series printers' exceptional color printing performance, which is at an impressive 1200 x 1200 dpi resolution. Like the other printers in the serie, it can be connected to your network via an internal 10/100 Base-T OkiLAN print server, and a powerful 500 MHz processor means less time waiting for documents to print from your PC or Mac. Every C7550n model ships with a standard 192MB of RAM that can be upgraded to 1 GB RAM. The C7550n will be an excellent investment for any medium to large size business that needs a versatile performer to handle its intensive printing needs. Single-Sheet Manual Feed: (available with duplexer only): Up to 11.69" x 35.43"